In my speeches, especially when talking about the fiscal crisis in Europe (or the future fiscal crisis in America), I often warn that the welfare state reaches a point-of-no-return when the number of people riding in the wagon begins to outnumber the number of people pulling the wagon. To be more specific, if more than 50 percent of the population is dependent on government (employed in the bureaucracy, living off welfare, receiving pensions, etc), it becomes rather difficult to form a coalition to fix the mess. This may explain why Greek politicians have resisted significant reforms, even though the nation faces a fiscal death spiral. But you don’t need me to explain this relationship. One of our Cato interns, Silvia Morandotti, used her artistic skills to create two images (click pictures for better resolution) that show what a welfare state looks like when it first begins and what it eventually becomes. I often conclude my speeches by joking with the audience that it’s time to stock up on canned goods, bottled water, and ammo. Many people, I’m finding, don’t think that line very funny. I am a great admirer of your work. I have looked at this matter in a charter in my up coming ng book. My conclusions are much the same bit you may find my reasoning interesting. Oh, and even more bad news. The birth rate in America is much lower than it is in third-world countries, so welfare will be an even harder burden on the payers. Which is just sad. We can support more kids! Our infant mortality rates are lower! Why don’t more people start families? So sad. imagey is everything! Sad but true… and only getting worse! One of the best cartoons I have ever seen. Constitutional amendment; cannot vote if you have been on welfare or food stamps within the past two years. You need to show the people on the cart with grossly atrophied muscles, and the people pulling it with permanent injuries from the places where the chains connect. There is a famous Chinese political cartoon done under Communism where they show a cart being pushed up a hill. Everyone is pitching in, with the party leader exhorting everyone to push and his hand is held out as if to push….but he’s actually not helping push. This is a subtle criticism that escaped the censors…wish I could find that cartoon again. The dems own the downgrade. The TEA movement is less than 3 years old. The TEA rep’s in DC have been on the job for about one year. Liberals have been making promises they can’t keep for 40 years and the entitlement welfare crowd keeps electing them as they run our nation to the ground with out of control entitlement spending. How convenient it is for the gutless liberals to blame TEA for their foolishness. TEA’s cut cap and balance would have saved us from this downgrade but the dem’s had to compromise it. So the people on the wagon are the bankers, corporations, CEOs, and Wall Street execs that we gave trillions to in tax cuts, subsidies, and other millionaire/billionaire welfare, right? They’re the bankers that took billions from the tax payers so that they wouldn’t be broke and jobless after they bet with customer money and toppled the economy, right? They’re the people that we didn’t jail, and instead gave money to, when they committed mortgage fraud, right? I beg to differ. The fellow on the wagon in the endgame panel isn’t holding a megaphone. He’s holding a whip. With barbs. There may be some shill with the megaphone. There will also be a band. And it won’t be one wagon. It will be a train of wagons. The fantasy on stocking up on food and ammo is that one would be able to defend oneself from the starving unruly hoards that beset the industrious like in Raspail’s Camp of the Saints. The reality that isn’t imagined is what happened in the Weimar Republic and in China, where the centralized power committees and politicians send out the police and military toseize land, houses, commodities, and precious metals or items of trade for more redistribution. Hiiding and waiting out the collapse won’t work. Neither will planning to try to defend against the Seizers. Nor will waiting for the last minute (the classic American approach) to get involved and then turn it around. .
there is a famous cartoon drawn in communist China where it shows a stuck wagon and a party leader approaching the wagon as if to help push it, but its noted that he does not push it….thus it was allowed by the censors but was social commentary…the party leaders say they want to help but don’t actually do so…that would be a great addition to this. 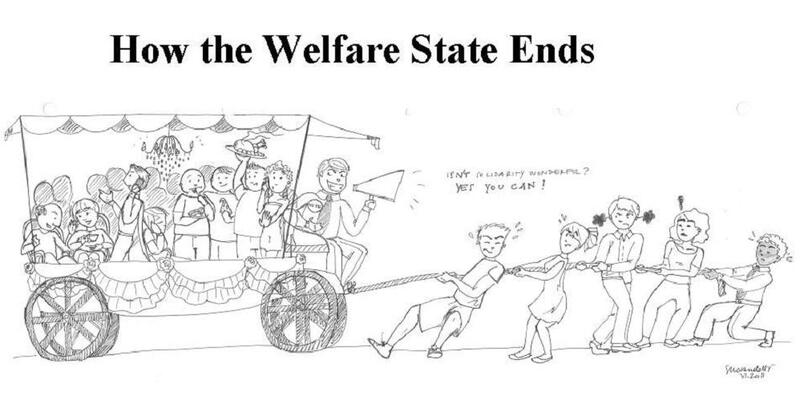 Actually, how the welfare state ends is when the wagon pullers walk off, giving those in the wagon the finger…. Thankfully, our current dependent class is anti-gun, for the most part. Make the welfare people accountable. Drug testing. If you have a baby fine, but any other children should not be covered. What novel ideas. . .We should try them at some point! Far be it for me to advocate for tax increases, but if those who do not pay taxes — due to overly generous welfare provisions and because of special waivers due to crony capitalism — are made to pay them through tax reforms, is there any possibility that now, as members of the wagon pullers, they will acquire a different perspective on the welfare state? Or am I being hopelessly naïve? Sharply reduce rates, broaden the base, simplify the tax code, and reduce the deficit by reducing the many “tax expenditures”—another name for spending through the tax code. Reform corporate taxes to make America more competitive, and cap revenue to avoid excessive taxation (p. 15). Apart from the part about ‘tax expenditures’ — which is often used to describe not the spoils of crony capitalism but legitimate tax cuts (such as those on dividends, capital gains, inheritance duties, &c.) — isn’t there some merit in this recommendation?